French oil giant will take a nearly 20 percent stake in the Lowell, Mass.-based organic photovoltaic solar cell maker, becoming its leading shareholder. The size of the potential market for Konarka's low-efficiency products remains an open question. French oil giant Total (NYSE:TOT) announced Monday that it is investing $45 million in Konarka Technologies Inc., making it the largest shareholder in the Lowell, Mass.-based organic photovoltaic solar module startup. Total's investment, through its Total Gas & Power USA subsidiary, gives it a nearly 20-percent stake in Konarka. Total's chemical subsidiaries also will work on developing new components for Konarka through research and development and cooperation agreements, the companies announced. Total's $45 million comes on top of more than $100 million in equity Konarka has raised from investors including Mackenzie Financial Corp., Good Energies, Pegasus Capital and Draper Fisher Jurvetson. The company was founded in 2001 to develop thin-film solar cells that use carbon-based organic materials, instead of silicon, cadmium, copper and other minerals that can be found in commercial solar cells today. 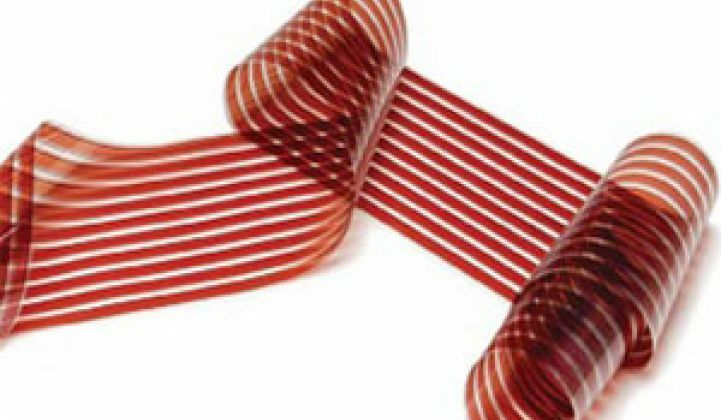 Other organic solar cell makers, such as 3G Solar, Dyesol, Heliatek and G24 Innovations, contend that their products can make up in low cost what they lack in efficiency (See Does Going Organic Require Exaggeration?). In October, Konarka opened a plant that it said could produce up to 1 gigawatt per year of its flexible organic photovoltaic "power plastic" material by the start of next decade. It hasn't disclosed its investment in the plant or how much its material will cost to manufacture (see >Konarka Claims 1GW in Organic PV Production). While the latest round of funding will allow Konarka to tackle manufacturing issues, some VCs will likely view the investment with a wary eye. Passing $100 million in funding is not viewed as a good milestone, particularly if the company in question isn't producing in mass volumes. "Some of the stuff I've heard Konarka talking about in the past is the small niche markets," said Rob Day, principal with @Ventures in Wilmington, Mass. Konarka has said its material could find its first uses as a way to turn portable consumer products like backpacks, umbrellas and tents into mobile power generators. "Maybe that's useful for proving out what they want to do, but the real key will be to see if they can make building integrated products that can stand the weather for 20-plus years," Day said, referring to solar products that can be integrated into building materials, a market other thin-film solar photovoltaic panel makers are also gunning for. Organic solar cells' low efficiencies in converting sunlight to electricity have limited their appeal so far, analysts have noted. While Konarka's goal is to make modules with better than 10 percent efficiency, so far its organic photovoltaic modules have yielded test efficiencies of only 6 percent. In comparison, thin-film market leader First Solar (NSDQ: FSLR) makes modules with better than 10 percent efficiency, and conventional polysilicon cells, which are widely used for solar panels on the market today, can reach efficiencies of more than 20 percent. Research firm NanoMarkets in May predicted that the organic photovoltaic market will generate about $1 billion in revenues by 2015, representing strong growth for the product, but still a tiny piece of the overall photovoltaic solar market. Another solar-cell technology developed by Konarka was licensed by British company G24 Innovations in 2006 to make small panels for charging cell phones and other electronic devices. The U.S. Army has given Konarka $1.6 million to develop materials for soldiers in the field. Konarka's technology is based on research by the deceased materials scientist and professor Sukant Tripathy and Alan Heeger, a 2000 Nobel Laureate in Chemistry. Total has other investments in solar photovoltaic companies. 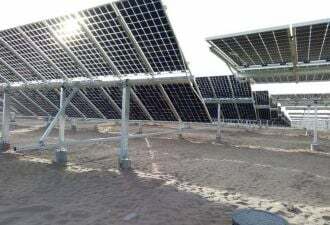 It holds a 47.8% interest in Photovoltech, which produces photovoltaic cells based on a crystalline silicon technology. Total also holds a 50 percent stake with French utility EDF in Tenesol, which designs, manufactures, markets and operates photovoltaic solar energy systems.